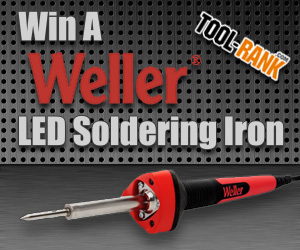 This month Tool-Rank has teamed up with Weller to give away one of their newest LED soldering irons. If you have ever done any soldering you may have noticed that if you do not have light in exactly the right place, it can be hard to see what you are doing. Even if you have light right above your work space, your soldering iron can cast shadows where it is most inconvenient. Weller's new LED soldering iron features three built in L.E.D's that are spaced around the soldering iron to shine light evenly towards the tip of the iron to help eliminate those shadows. So how do you enter? See the widget below and follow the steps. You have a total of 6 different ways you can enter this giveaway. You can enter using only one method or you can use all 6 and have more chances to win. Another great product from the leading brand in professional-quality soldering equipment since 1945. In addition to its famous irons and soldering guns, Weller is also recognized as a leader in advanced electronic rework and repair equipment and irons for sophisticated industrial applications, as well as numerous products for DIYers and hobbyists. Now Weller offers you more innovation and quality with superior ergonomics and flexibility and the benefit of LED technology built right into the iron for ease of use. While still maintaining compatibility with existing Weller tips. Weller® - Bring The Heat.